Julia and Mike were born on opposite sides of the world – Julia in the Ukraine and Mike in Florida – but like many love stories, fate decided these two should meet, fall in love, and live happily ever after. Julia was adopted and brought to the U.S. where she grew up in Niceville, Florida with aspirations of becoming a lawyer. Mike loved sports, golf and hockey in particular, and knew he wanted sports to play a part in his life somehow. After some time, passions shifted and molded, and the both of them ended up in orthotics and prosthetics school where the eventually met. Mike was a year ahead of Julia and the president of their student organization, and in Julia’s words, “I was attracted to older men with power.” HAHAHA! We love that! 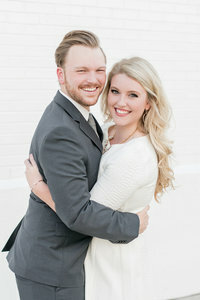 These two hit it off with their fun, soft-hearted personalities over a first date that included sushi and minigolf, and that spark quickly ignited into a flame that led them to tying the knot three and a half years later! We met Julia through Whitney & Taylor’s wedding last year, where Julia served as Maid of Honor and sister to the bride. So, we’ve already had a chance to get to know Julia’s sweet family, and we were so excited to do it all again, this time with Julia and Mike. We truly had a ball, and we think all the guests felt the same way. The food was delicious, the toasts were heart-felt, and the dance floor was hoppin’ all night long! Julia is such a hilarious, fun-loving soul, and Mike fits in perfectly in her world. We don’t think that anyone could be in the room with these two and not have an absolute blast! Julia and Mike – thank you for having these Alabamians down to Florida and letting us share in your amazing day! The love you two share is so apparent, and we’re so glad we got to witness it! You’ve got something special, Mr. and Mrs. Adams! Watch out world, here they come! Congratulations, newlyweds! !